The Nigerian Professional Football League (NPFL) Champions, Rangers International FC of Enugu began 2017 season as they started it in 2016. They succumbed to a 2 - 1 defeat at home to the visiting Abia Warriors FC. 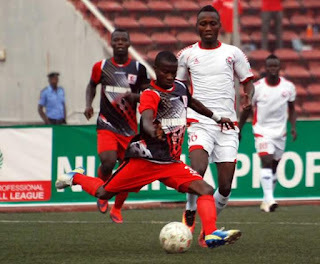 Fortune Omoniwari, newly signed from Akwa United FC gave the home team a lead in the 10th minutes of the encounter before Emeka Isaac's 25-yard effort in the 22nd minutes was deflected home after a well-worked corner taken by Bashir. Godwin Zaki scored from a spot kick in the 72nd minute and it stood as the decisive goal after blast of the final whistle. Two of the NPFL newly promoted clubs recorded victories. ABS were 3 - 1 better than Akwa United FC in Kwara State, while Katsina United FC registered 2 goals against Gombe United's single goal.